Description: BNSF 4474 & 4586 lead a train to the port at Charleston, S.C. Description: A BNSF Stack Train with a Heritage II, Heritage I, and another Heritage II as power. Description: The shot of the day! Description: coasting down hill in the rain. Description: BNSFs Stockton to Barstow manifest rolls through Modesto with C44-9W #4474 leading. Description: A zipper coasting down hill into town. Description: BNSF 4474 leading a stack train with a green signal for the other track and amtrak 455 sitting in the station. 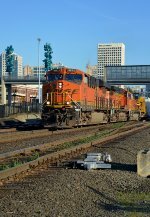 Title: BNSF 4474, BNSF's Aurora Sub. Description: BNSF 5462 leads a bare table across the Pecos River at Ft SUmner, NM. From here itwill climb a 0.6 % grade for 80 miles to Carnero. Description: A pair on BNSF units headed east split the signals at 280.4, midway between E. Syracuse and Kirkville along Saintsville Rd with 97 loaded crude oil train and two idlers. Description: Waiting for a light east at Vine.